More entertainment came on day eight of Rio 2016, as the Men's Team event drew the round of 16 to a close, and the number of countries remaining in the Women's Team category was reduced from eight to four. Two high profile teams escaped threats of an early exit, while Germany safely progressed in both of the events. Feng Tianwei won both of her matches, as Singapore avoided defeat to Korea Republic in a 3-2 spectacle. 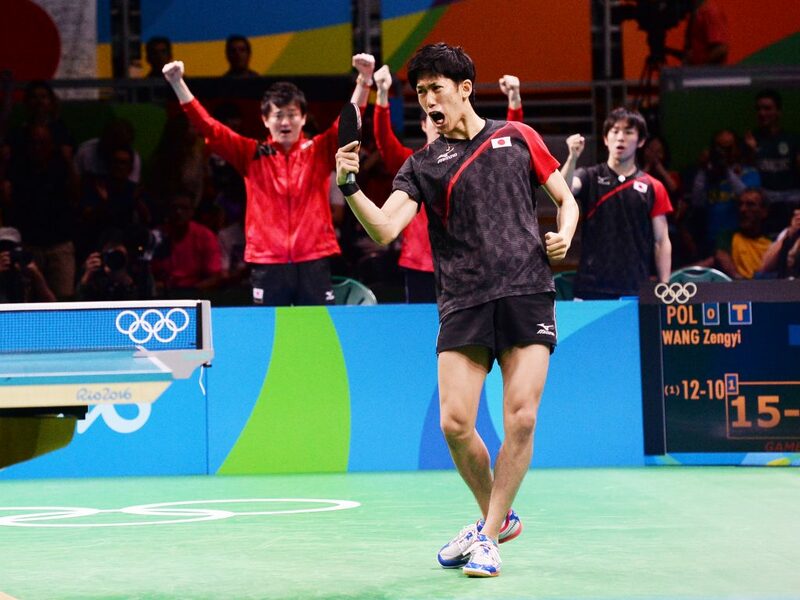 Korea entered the tie coming off the back of a 2-3 victory over Romania on day seven of the 2016 Olympic Games, leaving Singapore with the fresher legs, having beaten Egypt 3-0 in their previous match. Game one of Feng’s encounter with Korea’s Suh Hyowon ended up being completely one-sided for the Singapore player (11-2). Suh came out fighting after the break at the end of the opening end, but even her best efforts weren’t enough as Feng won games two and three (11-9, 12-10). Not the greatest way to begin the match for Korea Republic, however, Jeon Jihee made amends by passing Yu Mengyu 1-3 (8-11, 4-11, 11-9, 6-11). Soon after it was Singapore who found themselves trailing, as Jeon and her doubles partner Yang Haeun beat Zhou Yihan and Yu (7-11, 4-11, 11-4, 12-10, 7-11) to put Korea just one win away from extending their stay in the competition. “I won my first U21 World Tour title here in Rio back in 2011, and I won my first match here at the Olympic Games today, I think it’s a lucky place for me. I hope this luck continues for the rest of the Olympics.” – Zhou Yihan. China are looking more formidable with every round they play, as DPR Korea proved no match for the top seeded country. Li Xiaoxia (China), who recently won the Women’s Singles silver medal, went up against Ri Mi Gyong and disposed of her 3-0. Then Liu Shiwen stepped up to face DPR Korea’s bronze medal heroine Kim Song I, but again the Chinese team weren’t troubled, and the doubles also went to form as Ding Ning and Liu Shiwen won without losing an end against Ri Myong Sun and Kim Song I. Singapore will be the opposition for China in the semi-finals. The quarter-finals match between Japan and Austria saw the former of the two teams pick up their second 3-0 win in a row. 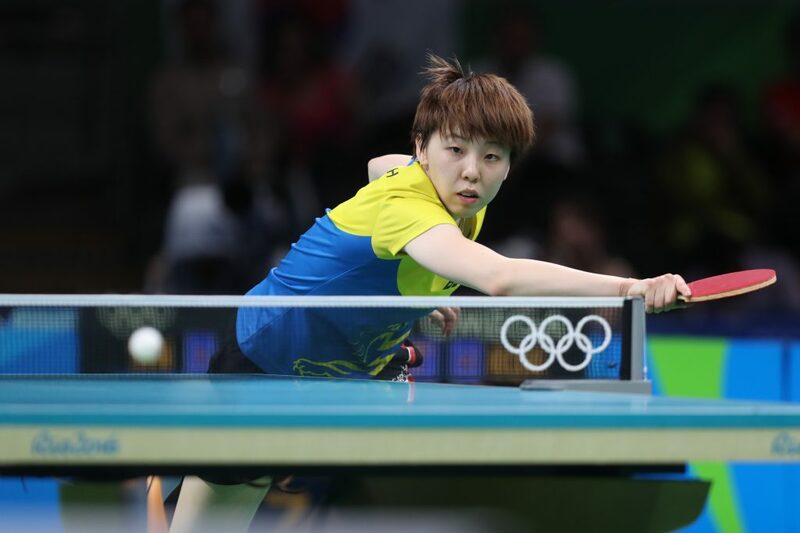 Ai Fukuhara handed Olympic debutant Sofia Polcanova (Austria) a 3-0 whitewash to put the Japanese ahead. Kasumi Ishikawa then followed suit for Japan by seeing off Liu Jia (3-1), before teenager Mima Ito and Fukuhara put the match to bed, beating Li Qiangbing and Polcanova across four ends. Jie Schöpp will be a very happy coach, after her players in the German team booked their spot in the quarter-finals. Japan await Germany in the next round, and the European side will head into the tie full of optimism following their 3-1 win against Hong Kong. Han Ying got Germany off to the perfect opening with a clean sweep victory (beating Lee Ho Ching 3-0), but Doo Hoi Kem levelled the score at 1-1 after she came from behind to overcome Petrissa Solja (Germany) in the five games. 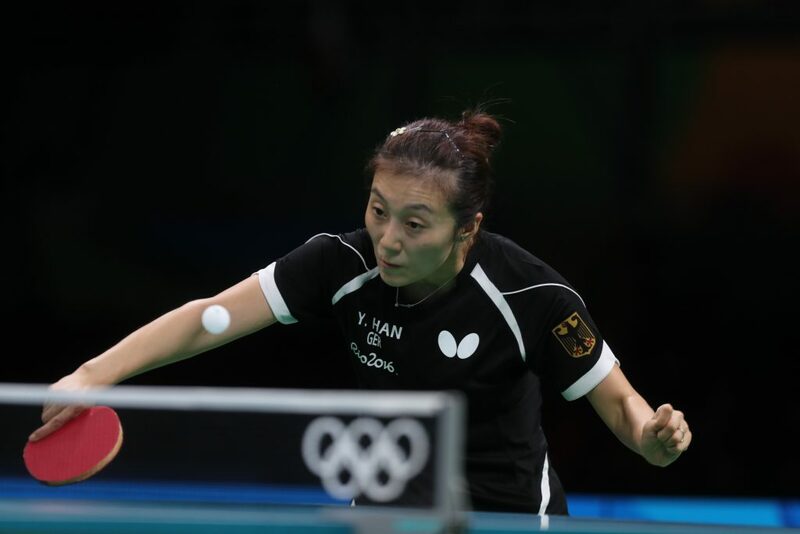 Shan Xiaona was then introduced to play with Solja in the doubles match for the Germans, which they won without great difficulty. Japan were given a scare by Poland in their last 16 tie, after they very nearly let the win slip out of their hands. The strong lineup of Maharu Yoshimura, Jun Mizutani and Koki Niwa looked well on their way to the quarter-finals after a good start, but the Polish team had other plans as the tie went to the final match. Yoshimura put Japan 1-0 up after he beat Wang Zengyi in an exciting four end encounter which saw three of the games go beyond deuce (10-12, 11-5, 17-15, 16-14). “I was nervous before the match but I quickly found a rhythm to my play and I became more and more confident as the match progressed; Wang Zengyi has a different style of play to most players but I was able to adapt. It did not cause me great problems.” – Maharu Yoshimura. Mizutani, who was seeded 4th in the singles event, then followed up with an expected victory over the 34th seed Jakub Dyjas (14-12, 11-9, 9-11, 12-10) as Japan moved into a comfortable 2-0 lead. However, what was to come next would cause great concern for the Japanese squad. Daniel Gorak and Wang recovered from 2-1 down to beat Koki Niwa and Yoshimura 2-3. Soon after, it was all square as Dyjas defeated Niwa in four ends (8-11, 11-7, 11-13, 8-11) to set up one more match, with Mizutani taking on Gorak. Both players contested some fantastic rallies, but there could only be one victor and it was the Japanese star who left the match the happier (11-9, 11-4, 8-11, 11-9). After crushing Australia 3-0, Japan’s next opponents will be Hong Kong. Tang Peng and Wong Chun Ting overpowered Australia’s David Powell and Yan Xin, before Ho Kwan Kit joined in with Wong to beat Heming Hu and Yan in the doubles with all of the matches ending in straight game wins for Hong Kong. European champions Austria knocked out a tough Portuguese side, to boost their medal hopes. Both teams fielded capable players and the tie happened to be a rematch of the 2015 European Championship last eight encounter between the two countries, which was edged 3-2 by the Austrians. 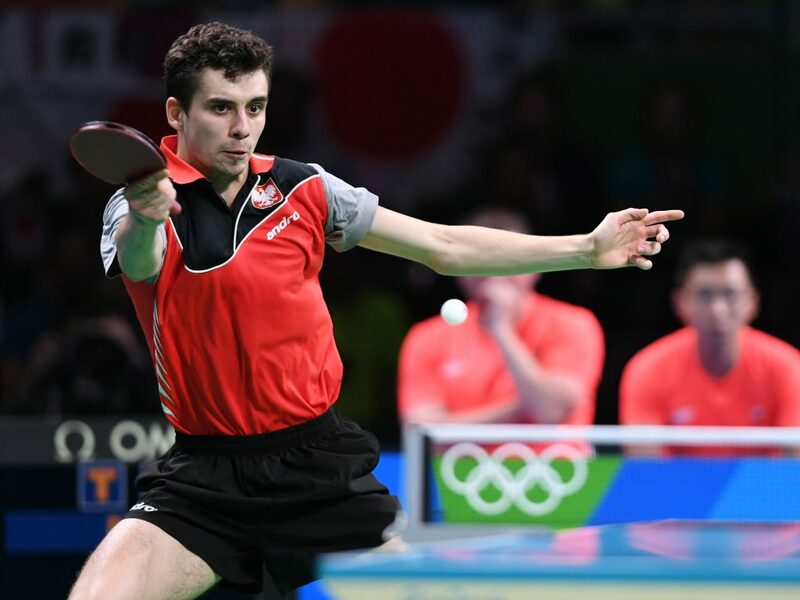 Robert Gardos triumphed 3-2 over Tiago Apolonia in the Rio 2016 match to give Austria the lead. Portugal’s World number 11 player Marcos Freitas then battled it out with Stefan Fegerl (20th) which was again won 2-3, but this time with the score in Portugal’s favour. The doubles match also provided drama as the pairing of Daniel Habesohn and Robert Gardos beat Joao Monteiro and Tiago Apolonia 12-10 in the final game, before Stefan Fegerl ensured Austria’s place in the quarter-finals following a 3-1 victory against Monteiro. Fresh from his win over Monteiro, Stefan Fegerl drew comparisons to their encounter at the European Championships, “It was nearly the same today as last year in Ekaterinburg; against João, I was under less pressure than him, we had won the doubles, we were ahead.” Fegerl added “I felt I could win the rallies; I felt confident with top spin to top spin from both backhand and forehand. It was a 50:50 match against Portugal, today we had the luck”. Germany are also through to the next round, having beaten Chinese Taipei 3-1. Timo Boll opened the tie by beating Chen Chien-An before Dimitrij Ovtcharov made it 2-0 with a win over Chuang Chih-Yuan (3-1). 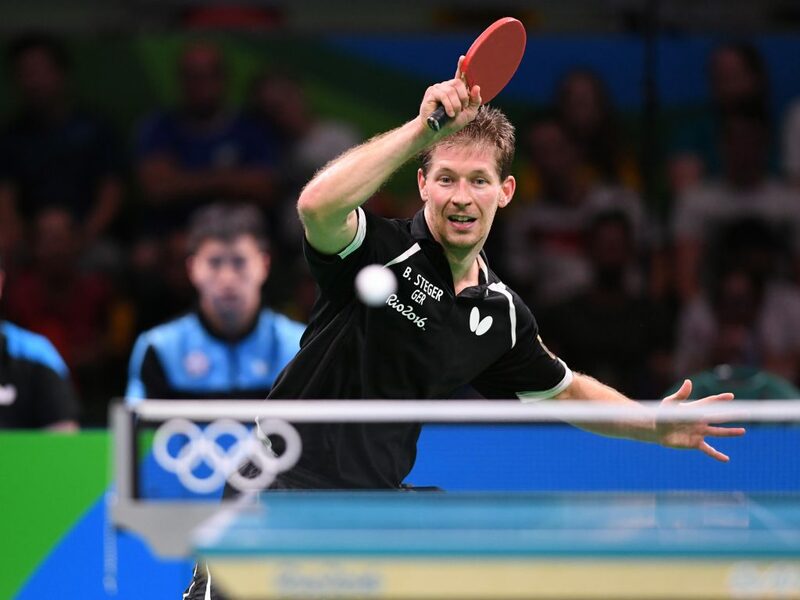 Taipei did put a point on the scoreboard as Chiang Hung-Chieh and Chen squeezed by Bastian Steger and Boll (2-3), but Steger caused a major upset (beat Chuang 3-0) to send the German team into a match with Austria on Sunday.